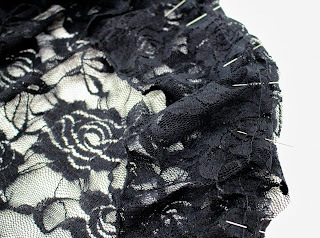 Sewing In BeTween: The long awaited Stretch Lace Skirt Tutorial! Measure your waist. Once you get that measurement, subtract 2”. Cut your elastic that length. Example: Her waist measurement was 26”, so we cut a 24” length of elastic. This is probably the trickiest of the measurements since the front is a different length than the back. 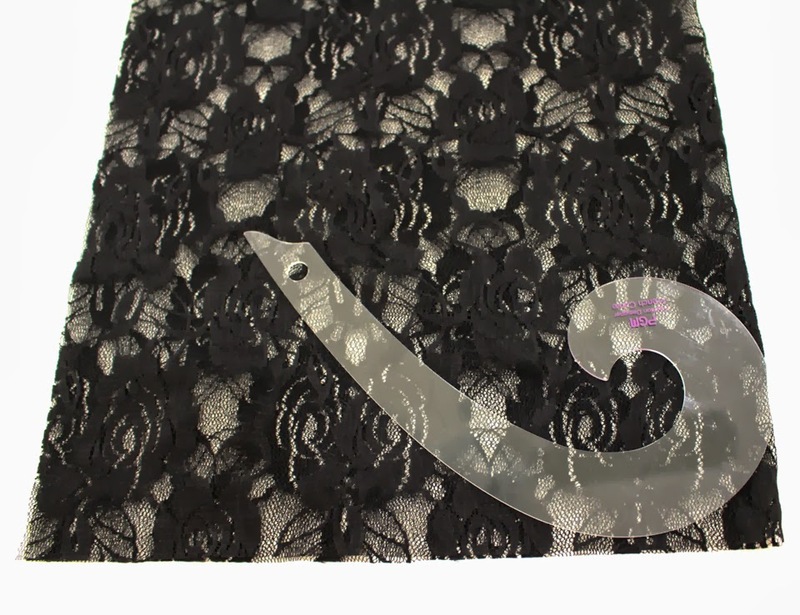 You will need three measurements to cut your lace. 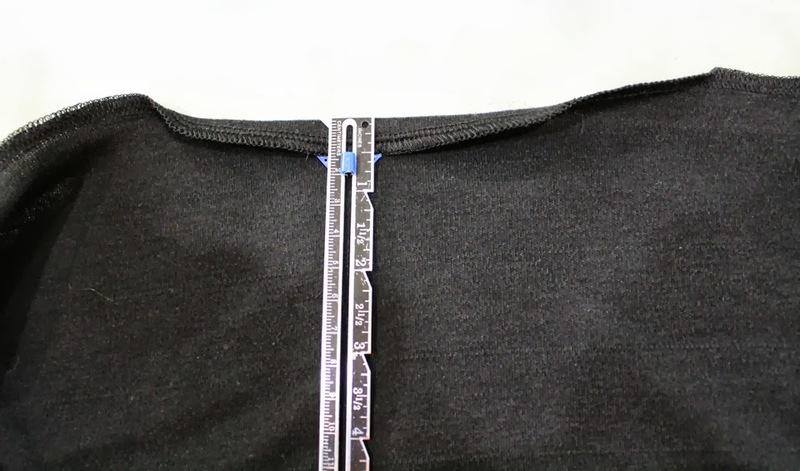 Remember you have 2” elastic and you will have a 4” ruffle at the bottom, so take your WAIST TO SIDEPOINT measurement and deduct 5” (this will give you seam allowance). This will be the LENGTH of the front panel you initially cut. So, for our size 12, our side point measurement was 24” subtract 5” and you have 19”. To get the width use your waist measurement. Our waist measurement was 26”, so we will cut the front panel 19”Lx26”W. Once you cut this, fold it in half and mark the center with either pins or chalk. Open up your skirt. At that marked middle line, measure up from the bottom to your WAIST TO SHORTEST POINT measurement. Make a mark there. You will now make an arc starting at one corner, peaking at the center highest point and ending at the opposite corner. You can use a bowl, french curve or other rounded edge to get this nice and perfectly curved. Once you mark, cut along the arc this will make your front asymmetry. Now you have your front panel. Take your WAIST TO BOTTOM BACK measurement from above and subtract 5”. For our example, my measurement was 30” - 5 = 25”. 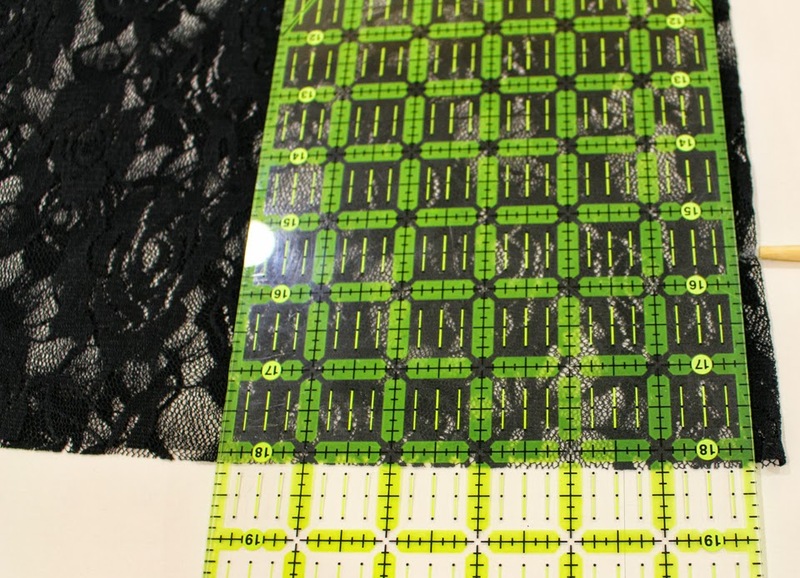 This will be your length for the back panel. 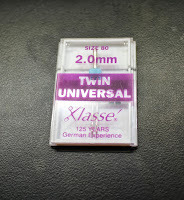 Your width will be the waist measurement, so for me that is 26” So, I will cut a piece 25”Lx26”W. Once you cut that piece, take your bowl or french curve and mark a curved edge on both outer corners and cut this curve. The purpose of this is to round the back panel piece. Don't use a curved edge that is too deep to avoid losing back length on the sides. By doing this it will give you the continuous curved look front to back. See the picture - the curve basically just takes the angle out of the corner. *CUTTING TIP* - To save fabric, cut the lace lengthwise for your back panel measurement. Most stretch lace is 60” wide. After you cut the length (for us 25”), cut the width (for us 26”) That leaves approximately a 25”Lx34”W piece. Use that piece to cut the front panel, which for us was 19”Lx26” which you can easily cut from that piece. This should work for the smaller sizes under 30” waist. RUFFLES - For this tutorial, I used 4” ruffles. I cut 2 widths of fabric (WOF) by 4”L” If you are making smaller sizes, this will be a ton of ruffles. You may only need one. For bigger sizes, you may need more. To determine this measurement, take a tape measure and go around the bottom edge of both the front and back pieces and get an approximation of how big around your skirt it. If you want really ruffly, take that measurement times 2. If you want moderate ruffles, multiply times 1.5 and then cut that length by the 4”. 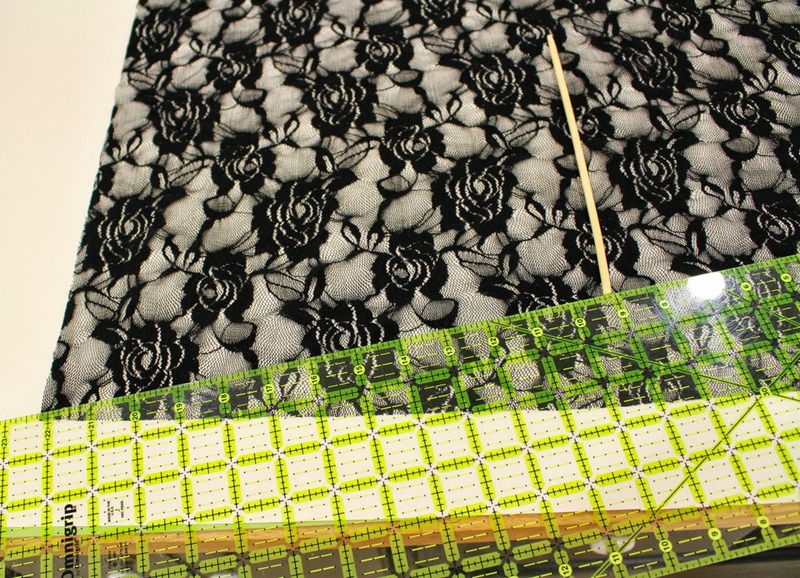 We are cutting the fabric for the knit lining based on the knee length. We still have the 2” elastic to account for but we don’t have the ruffle since this is just for lining. 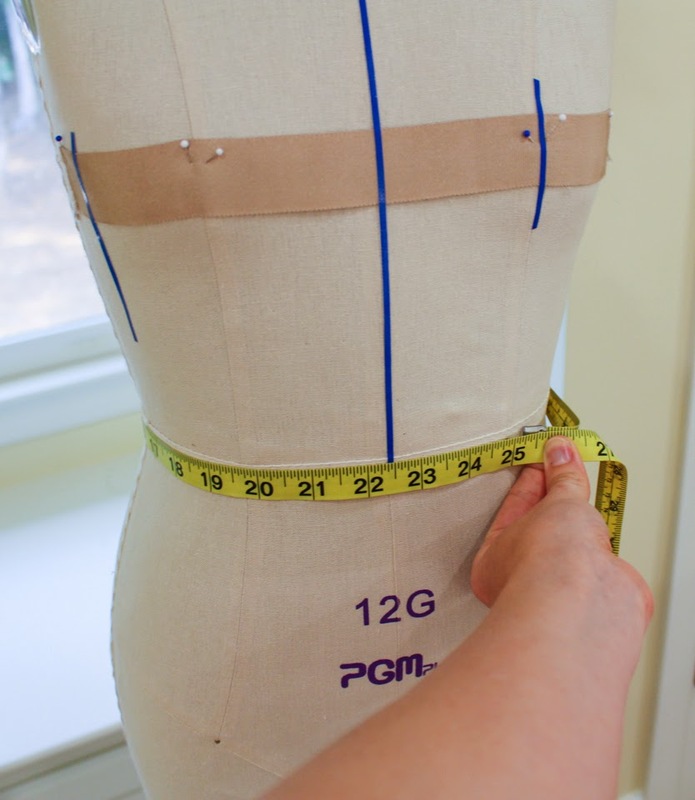 So remember your waist to knee measurement and subtract 1.5” to account for our seam allowance and hem. So, our WAIST TO KNEE was 21” - 1.5” = 19.5”. 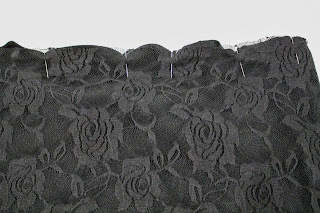 We are still going to need our width to be the 2x the waist measurement we used for the stretch lace. The good thing is, for waist measurements under 30”. you only need one piece! Bigger than 30”, thats ok, you will just have to cut 2. So, for this size 12, we cut the length to 19.5” and then just cut a 52” width (for our 26” waist.). This way we only have one side to seam. If you had a 32” waist, you would just cut two 26”Lx32”W panels and seam them together. Guess what, now its FUN TIME! 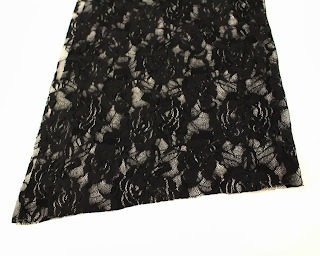 So, let’s get our sewing machines and/or sergers ready and whip this skirt out! 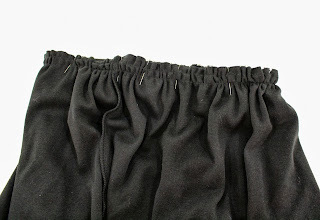 *TIP - Now is the time to put it your ballpoint needle to sew these stretch fabrics. 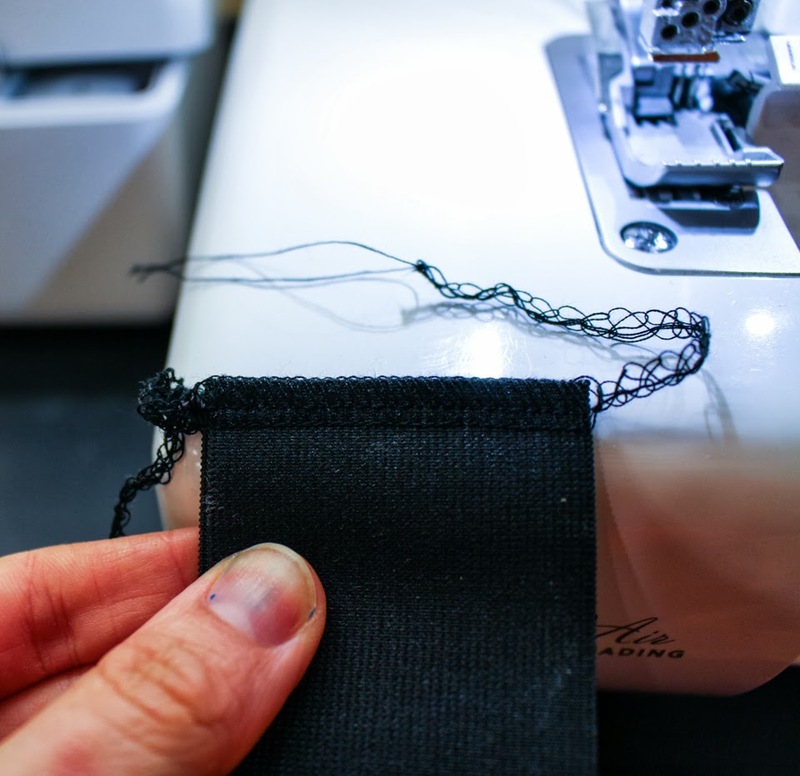 Also, if you are going to be sewing only with the sewing machine, you will need to find either your stretch stitch or zig zag stitch. 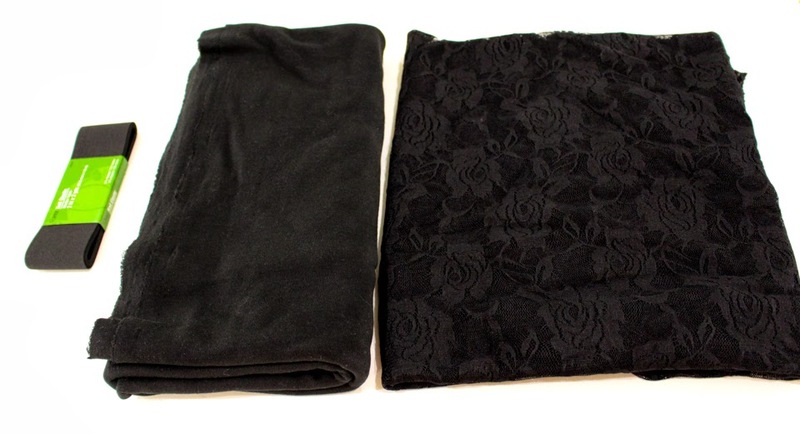 These will give the fabric the ability to stretch still once you sew them together. 1.) 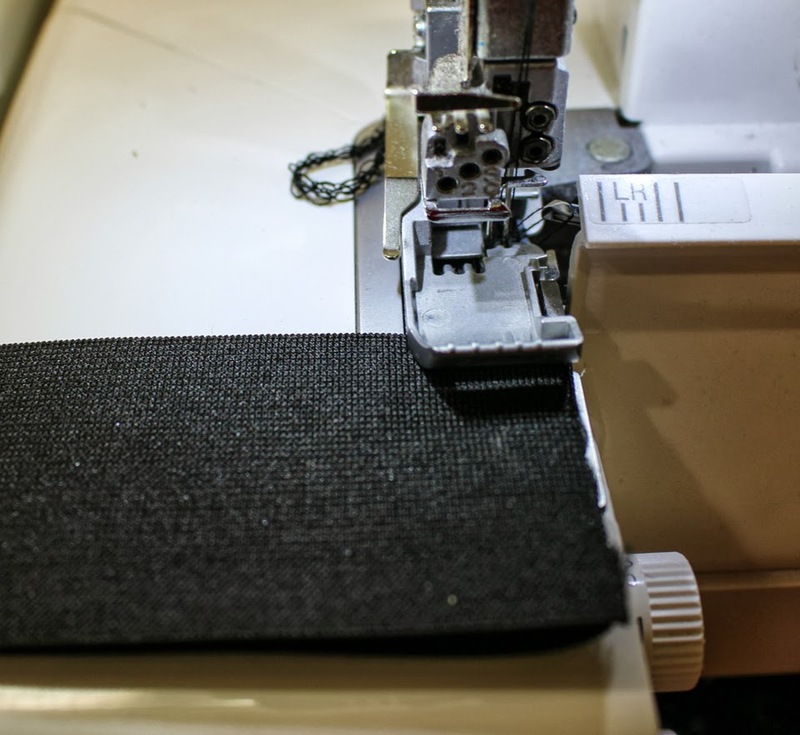 Take your elastic piece, if using a serger, place short ends on top of each other and serge. 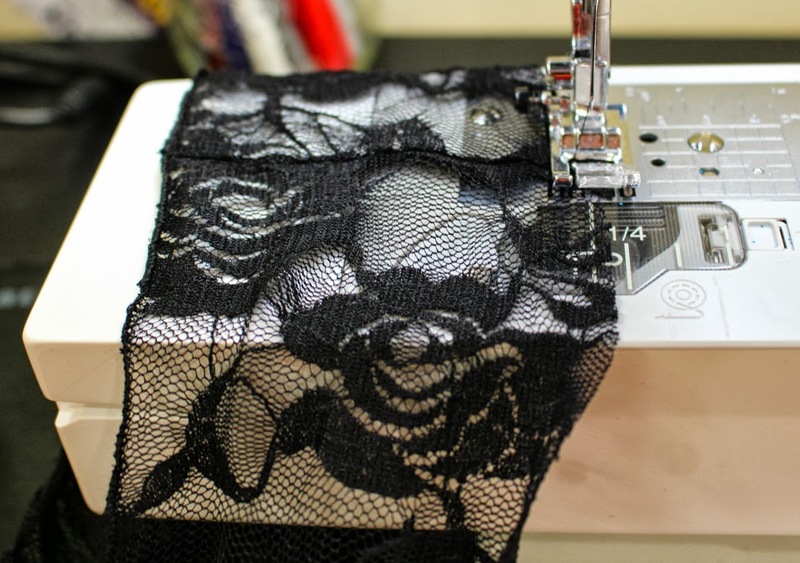 If using a sewing machine, do the same with your zig zag or stretch stitch and stitch together. Push the seam to one side and top stitch it down. Set to the side for now. 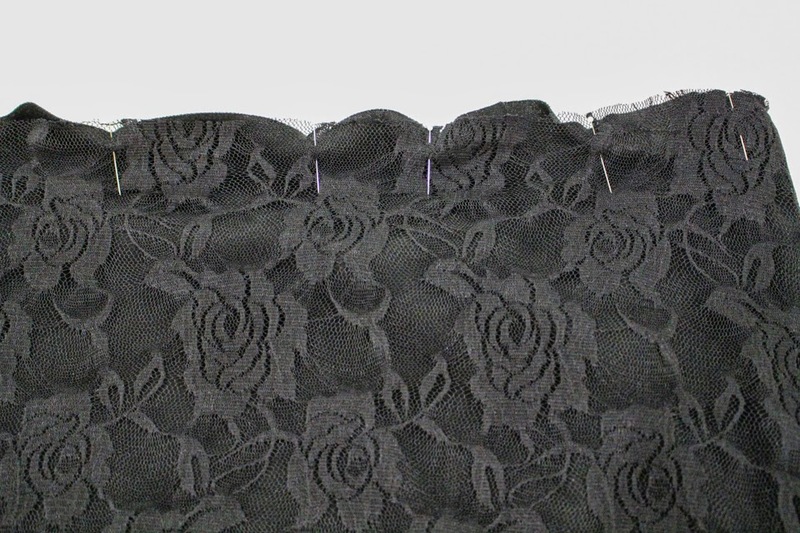 2.Take your front and back stretch lace panels and put the right sides together and sew the two side seams together. Its ok that the seams don't go all the way down, go until they stop.Either serge or zig zag stitch. 3.) 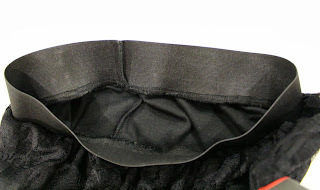 Take your knit fabric and if you are using one piece of fabric, fold it over on itself widthwise and sew the side seam. If you are using two pieces, place right sides together and sew the side seams. 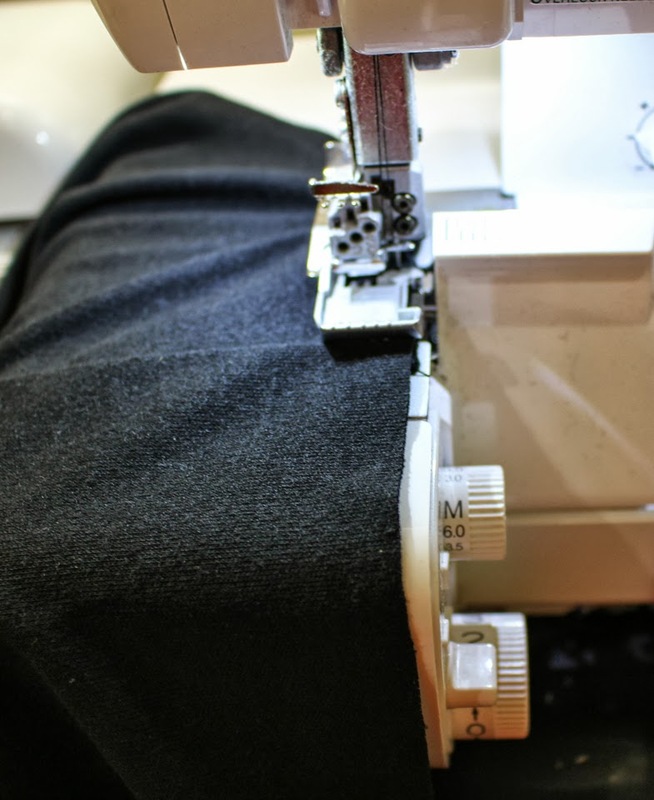 Take your knit pieces and press up 1/2" on the bottom edge to form your hem. Then, you can put in a double needle and sewing from the right side, sew your hem. The double needle gives a great professional look. This isn't required, but makes it look nicer. If you don't use a double needle, stitch a regular stitch set on a longer stitch length. 4. )Take your ruffle fabric pieces and attach them at the short edges. Form a circle with them. You will need to finish the edge of this loop. 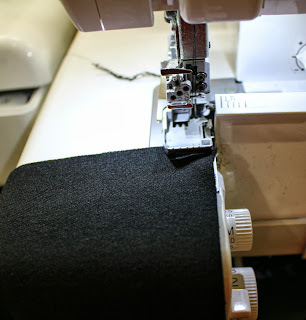 I used a rolled hem on the serger. Next you are going to sew a gathering stitch at the top of this loop. To do this, set your sewing machine length at the longest length and pull out your top thread and bobbin thread so you have two tails out on your sewing machine. 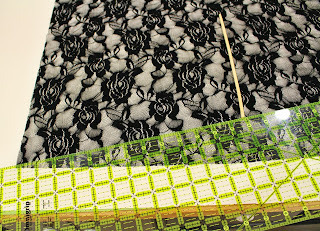 Sew two lines of gathering stitches making the top one at ¼” and the second at ⅝”. Leave the tails. If you are using two pieces with two seams, pin these seams to the side seams on the skirts and gather up the ruffle to fit the perimeter of the bottom of the skirt. 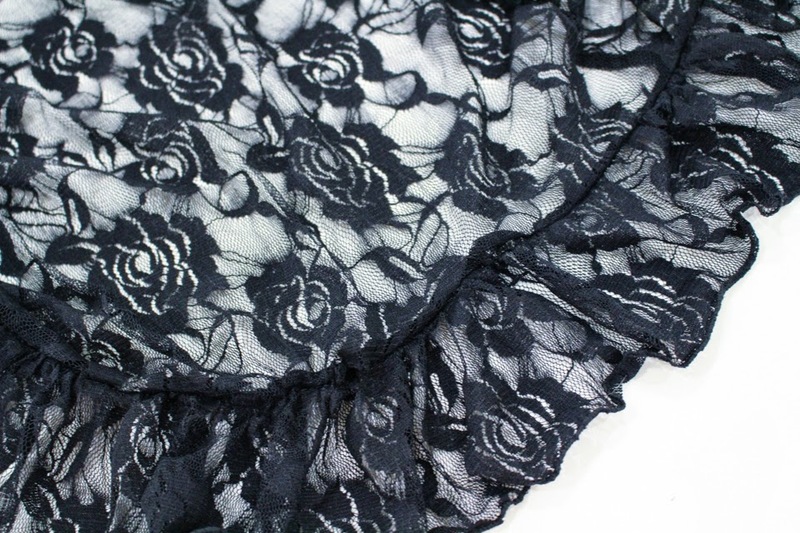 Pin and sew the ruffle on either with the serger or sewing machine. 5.) Take your knit skirt and place it inside of the lace skirt skirt with the knit and the lace right side facing out. Pin or baste along the top of both layers to secure. This is a good opportunity for you to make sure the length of your underskirt is hitting where you want it to under the lace. 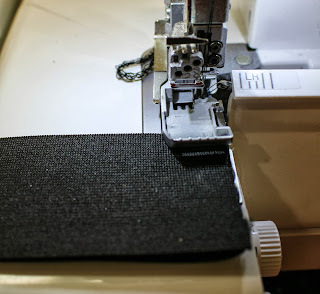 If it is too long at this point, you can measure and fold up and place another hem stitch. 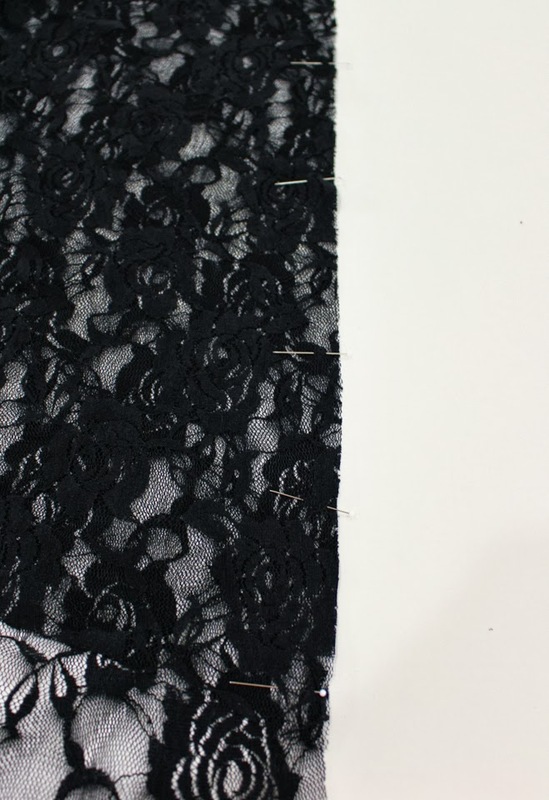 Once you are happy with the length of the underskirt, then run the two gathering stitches at the top of the two layers of fabric. Next, take your sewn together 2" elastic and put it inside the skirt with right sides together. 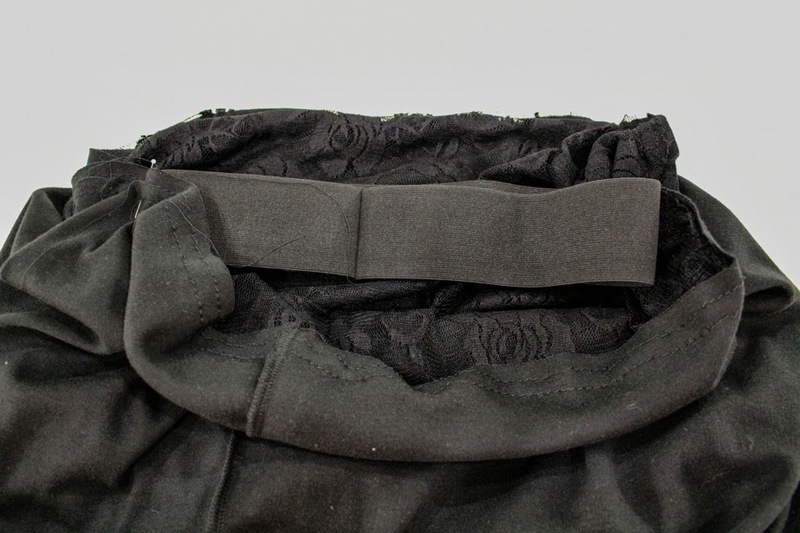 gather the skirt to fit the elastic. Pin and serge/sew. 6.) Flip right side out and admire your work! Go and work that awesome new skirt! And I saved this tidbit for last - this is actually 2 patterns in ONE! Now that you have this, you can make a solid knit skirt. All you have to do it make the skirt following just the stretch lace instructions using your favorite knit and some 2" elastic. 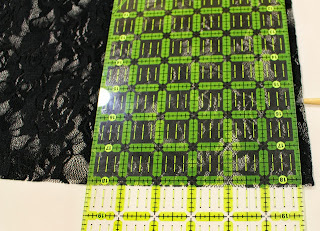 Since it is opaque, you don't need an underskirt. I haven't tried it yet, but I think I will! I hope you enjoyed this tutorial. 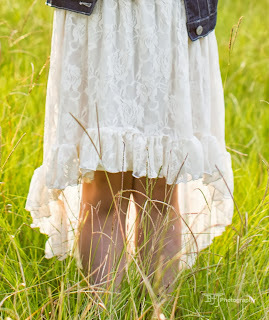 Please send pics if you make this skirt. Be sure to like us on Facebook and Twitter at @Sewinginbetween. 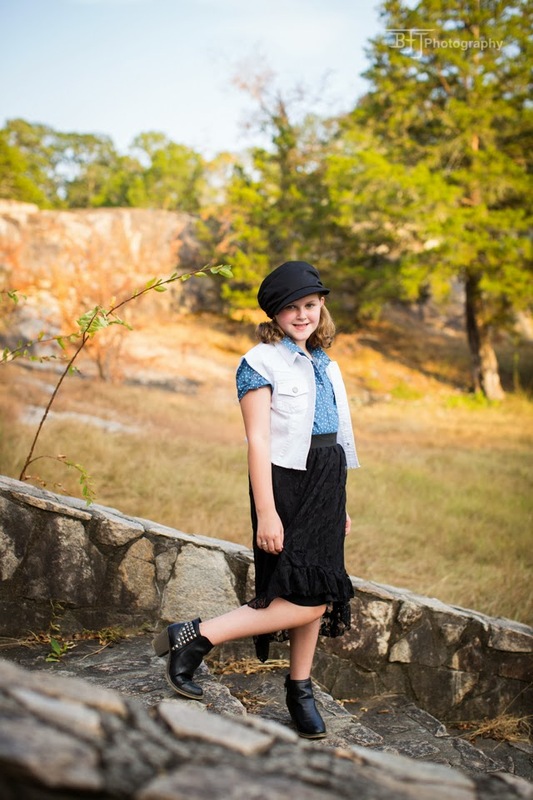 Our blog is sewinginbetween.blogspot.com. Please let me know if you have any suggestions to improve this. Feel free to pin this on Pinterest to share if you think others would like it! 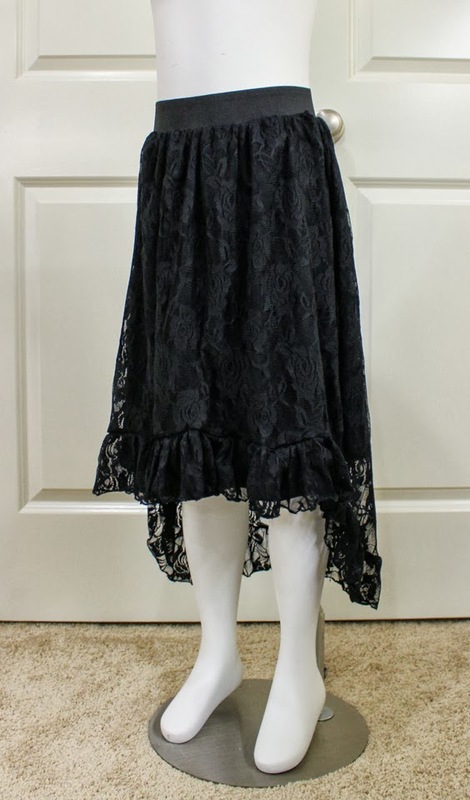 Can you use non stretchy fabric for this skirt? I think you can use non stretchy fabric! Maybe also like with best embroidery machine and best sewing machine.